As students dash to class along a music-filled corridor, ballet shoes dangle from their backpacks. It could be a scene from a 1980s American dance movie. But this 2017 in Iraq’s capital, Baghdad. In a city where IED explosions, car bombs, gunfire and mortar shells killed 90 people in March alone, the Baghdad Music and Ballet School is a haven where teens can pursue their passion for the performing arts. Iraq’s only music and ballet school was established in 1968, with a Russian teaching staff. In 1982 the government decided Iraqi staff, trained in Moscow, should take over. It provides a unique facility for its 530 students, who spend their mornings learning conventional subjects, then at 12:30 pm each day melodies chime out and the rigorous music and ballet dance classes begin. There are a handful of private music schools in Baghdad but no other school in Iraq offers ballet classes. And because it is overseen by Iraq’s Ministry of Culture rather than the Ministry of Education, it’s the only government-run high school to allow mixed-gender classes. Assistant principal Madeeh Qassem, 53, wishes the government would “take care of this issue” and open such facilities in every province. Teachers pride themselves on a passionate, engaged ethos. However, the sight of armed police guarding the school’s imposing iron gates is a reminder that it’s not always a ‘von Trapp’ style dance and sing-along here. Kids and teachers work in a dangerous environment that includes regular terror attacks, and must contend with some Iraqis who believe their curriculum is “haram” — immoral — in the eyes of Islam. Only 80 of the school’s current pupils have made it through to high school classes for ages 12-17, with the other 450 in elementary school and kindergarten classes. As well as social pressures, students face an unusually intense workload that some find to be an overwhelming burden. Many children eventually leave for high school education elsewhere. Some senior classes have as few as five students. Mass is in 3rd grade. She believes her country needs to develop, to accept and appreciate dance — a “classy” art that she says gives her a feeling of relief. However, it’s rare for the pupils to share their talent. Security conditions mean performances are kept to a minimum, and the only audience most students have is their own parents. A rise in extremism has battered Baghdad in recent months. At least 50 people were killed in February when an explosives-laden vehicle blew up — an attack claimed by the media arm of ISIS. Such a tense environment limits the opportunities for the school’s pupils to excel in a performance-based career. “I live and breathe music. It’s my thing,” says Sherwan Mohammed Dhia, 17, a fifth-grade student. For dancers, there is little future in Iraq beyond graduating to become a teacher at the school. Others who are inspired by Western artists seek fame or a career overseas. For music students, more opportunities are within reach. 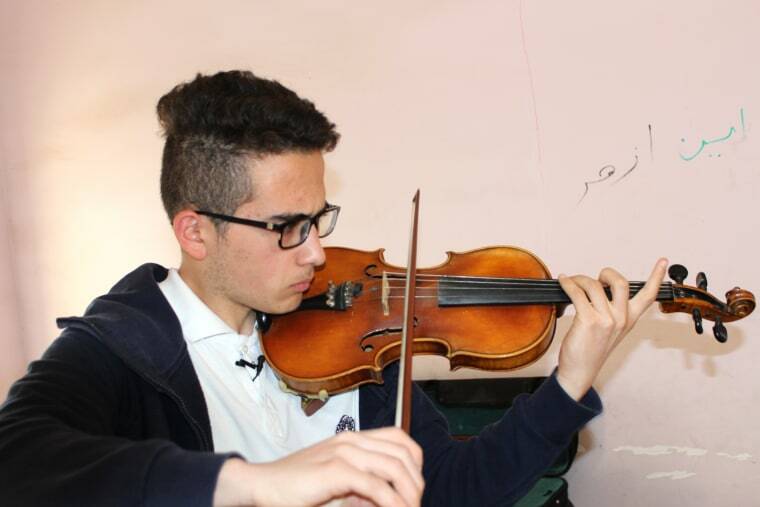 Sherwan, a burgeoning violinist who has learned English, has landed himself a place in the Iraqi National Symphony Orchestra. “I started listening to Eminem, the rapper, he is my idol,” he says. “I learned much of my English from him. I watch only American or English movies, it teaches me a lot. This determination is evident in rising student applications for the school. For young people in Baghdad, the school is a symbol of artistic defiance.